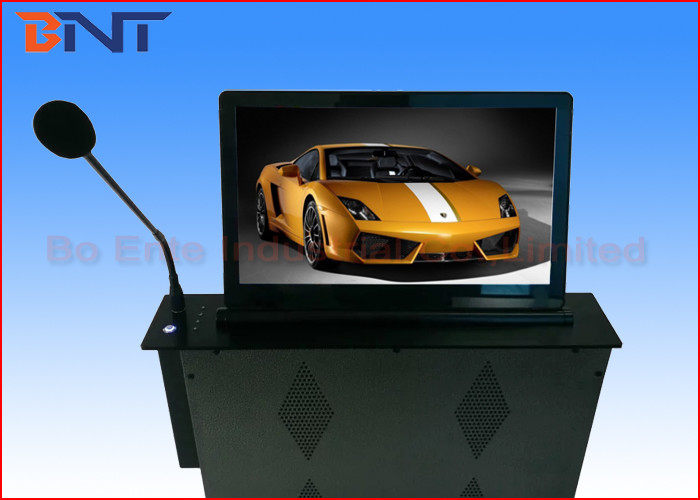 LCD Monitor lift is an electric lifting system for LCD monitor and microphone in audio video conference system solution. Motorized lift adopt circuit board to control superior motor working, motor working drive gear holding-on double rack to moving up and down. Its electrical system represents a high technological solution that provided efficient manner and enjoyable experience in conference communication and information presentation for meeting. Electric lifting system could be complicated with all brands monitor and conference system discussion microphone. The monitor and microphone could be lifting up or down together by control remotely during meeting. Also the discussion microphone could be complicated for camera digitize tracking. Through Crestron central controller or wireless automatically system, office paperless software, each user in meeting could operate the monitor with own information individual and share with others during meeting. It could realize paperless office audio video system. 1, 8.8cm super slim design with 18.5 FHD screen. 2, Solid mechanized aluminum brushed hosing in anodized finishing.Upper cover plate in brushed aluminum alloy. 3, 12V step motor with simultaneous drive for multiple movements. 4, Electric powered lift system with variable speed, Vertically silent Operation. 5, Custom Color aluminum anodization. LCD monitor lift is available for aluminum silver, black matte, aluminum gold, oxidation titanium. 6, Desk LCD monitor lift provides protecting function of HD screen monitor by cutting electricity off automatically if reach the monitor lift bottom and powering screen on if reach the top. 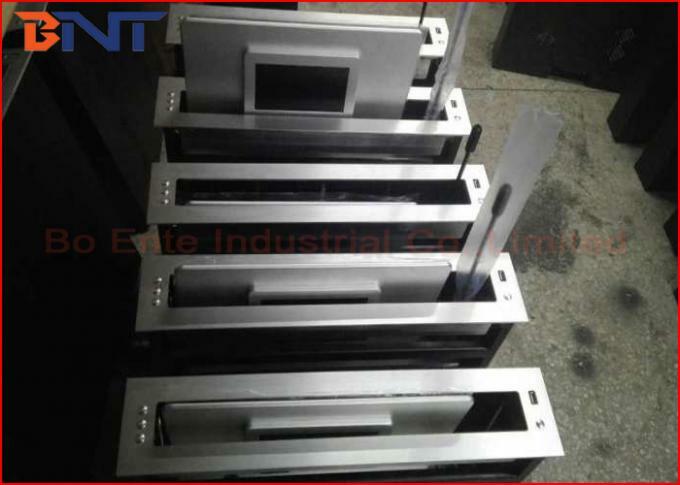 7, Screen of motorized monitor lift angle adjustable available from 12 degree to 30 degree as required. 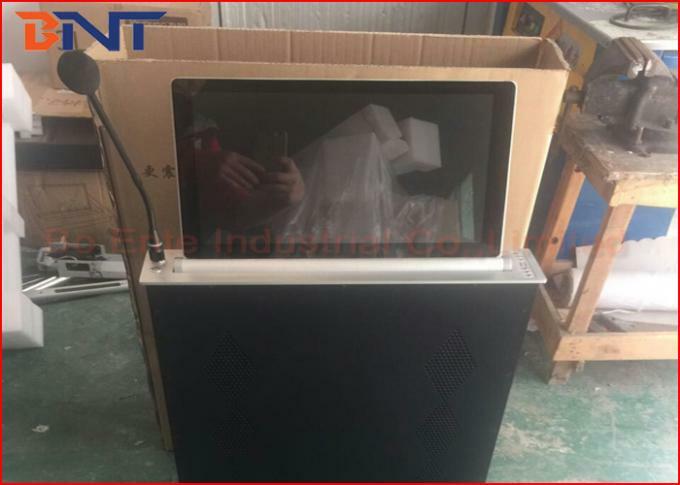 LCD Monitor Lift with HD screen all in one system is widely used on conference system, like video conference system, TV conference system, financial analyzing system, advanced office system, lecture and training room with conference table.